Angela Latta has been creating these tasty products since 1997. Her goal from the beginning was, and still is, to make every recipe she created quick and easy to prepare while being full of flavor. Through years of experimenting and refining, that goal has certainly been achieved. 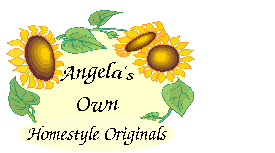 At Angela’s Own Homestyle Originals we continue to use simple, quality ingredients wherever we can in our continuing effort to make our products as natural as possible.